Redeemer in the Womb: Jesus Living in Mary, by Prof. John Saward. San Francisco, CA: Ignatius Pr., 1993. ISBN: 0898704278. 184 pgs. [An in-depth, insightful, and informative examination of the importance of Christ’s hidden life in the womb of Mary. With a historical and theological perspective that is accessible to the lay reader, Saward reveals how God becoming incarnate as an embryo and passing through the first nine months of life affirms the sanctity and dignity of every unborn child and demonstrates that conception is the undeniably true beginning of human life, not only from a biological perspective, but from the theological perspective as well. The book also highlights the significance of the Feast of the Annunciation. Click the following link to an article on cloning to read an American Life League article that reprints the entire first chapter -- scroll down to the section "The Moment God Became Man."] The paperback can be purchased through http://www.bookfinder.com. Copies are also available through the Family Resources Center of the Peoria Diocese Respect Life Board, e-mail famresct@mtco.com or call 309-637-1713. An interview on "Redeemer in the Womb" with author John Saward that aired on "Mother Angelica Live" can be purchased through EWTN here or by phone 1-800-854-6316 -- ask for BEST OF MOTHER ANGELICA LIVE Item # MA 00278 -- for CD Item # MA 00278 C -- or for DVD Item # MA 00278 D -- Orig. air date 11/10/93, rebroadcast 11/18/08 and 12/14/10. Unborn Jesus Our Hope by George A. Peate with a foreword by Ronda Chervin, Ph.D. Niagara Falls, NY: Life Cycle Books, 2006. ISBN: 0919225314. 173 pgs. "Life Is a Miracle: Families Celebrate March 25, the Feast of the Annunciation." Diocese of Peoria Respect Life Board. Peoria, IL: The Family Resources Center. This booklet is a collection of ideas, reflections and suggestions for celebrating the feast. It includes books, songs, videos, prayers and more. The booklet can be ordered on-line here or by calling the Family Resources Center at 309-637-1713. “A Lenten Reflection On The Beginning of the Passion Of Christ”--This companion piece to the Annunciation Church/School Program described above stresses the sacrificial nature of Christ’s entire earthly life from conception. To order the booklet, contact the Family Resources Center at 309-637-1713. NEW: "The Life of Jesus In The Womb: A Meditation and a Prayer"--14-page booklet by Kathleen Curran Sweeney enhances Annunciation-launched spiritual adoption programs--available via One More Soul. 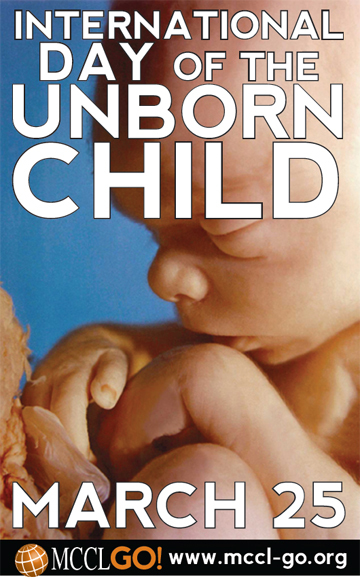 (Cover shows Christ saying "This is my body…" offering the spherical communion host juxtaposed with a color photograph of a spherical human zygote). One More Soul can be contacted via www.omsoul.com -- 800-307-7651 or 800-307-7685. Contact the Family Resources Center at 309-637-1713. NEW: "Celebrating the Annunciation and Incarnation of Jesus"--Annunciation reflections booklet includes play for student performance on the Annunciation entitled--published by One More Soul, available via OMS or the Family Resources Center. This companion to the Annunciation Church/School Program offers an additional option for celebrating the day. Perfect for parish and school-based observance of the feast, this booklet includes reflections and thoughts of Biblical figures, suggestions for prayer and Rosary meditations (particularly the Joyful Mysteries), and an Annunciation-themed play that can serve as a counterpart to the familiar Christmas plays that bring the events of Christ's early life to the young performers and family members of all ages who attend in a way that leaves a poignant memory for all. In addition to print copies of the play, a DVD will soon be produced (contact the FRC for availability). One More Soul can be contacted via www.omsoul.com -- 800-307-7651 or 800-307-7685. Contact the Family Resources Center at 309-637-1713. Mary’s Pregnancy. Willke, J.C., M.D. Cincinnati, OH: Hayes Pub. Co, 1989. A Spanish language book addressing the prenatal life of Christ. Pope Francis wrote the introduction to de Mouriño's book when he was Cardinal Bergoglio--for more on the Holy Father's contribution click here. Click this link to read (in Spanish) about the book -- scroll down to: "7. ANUNCIOS IMPORTANTES." -- "(3) Nuevo libro revela la intimidad maternal de María con su Hijo Jesús" -- the article addresses the topic as it relates to the Feast of the Annunciation/Incarnation. Another article on the book can be found here -- scroll down to "ARGENTINA: LOS NUEVE MESES DE JESÚS EN EL SANTUARIO DE MARÍA. Julia E. Gómez Caride de Mouriño." To purchase click here. If unavailable from that source, contact Editorial Claretiana: e-mail contacto@editorialclaretiana.com ; website http://www.editorialclaretiana.com/. For additional information, contact the author at http://www.rioporlavida.net. For more on the concept of Mary as first tabernacle click here. A free translation site can be found here -- to read the content of these links in another language -- for example, to read in English, copy/paste the desired text or URL web address into the box at the translation site, then select "from Spanish" "to English" and click the "Translate" button -- note that translations may have inaccuracies. My Time With Jesus: The Annunciation. A video on the Annunciation for children, available through EWTN Religious Catalogue -- available in DVD format -- for more info click HERE. Unborn Word Alliance offers large format (6”x4”) full-color pro-life prayer cards designed for modern sensibilities, featuring prayers focused on Christ’s prenatal life--they also offer a free sample. The cards can be viewed and ordered via its on-line store. Most appropriate for distribution on March 25th are “Litany of the Unborn Christ Child” (also avail. in Spanish), and “Angelus of Praise/9 Reasons to Honor Unborn Jesus)” (also avail. in Spanish). For more information e-mail info@unbornwordalliance.com or visit their contact page to order the free sample. The Litany to Jesus in the Womb of Mary by Marta Catalano (also known as "The Helpers' Litany to Jesus in the Womb of Mary") -- this prayer can be found in the Pro-Life Action League's "Life Witness Prayer Book" available at their on-line store. Read more about it here. The Litany is also the closing prayer from "Prayers for Peace and Justice: Act Justly, Love Tenderly, Walk Humbly." The prayer litany was written by Marta Catalano, a member of The Helpers of God's Precious Infants (718-853-2789) located in Brooklyn, NY. This beautiful image has been produced in various formats including prints and plaques. Visit https://www.churchsupplywarehouse.com for their current offerings. The Lamp Book Shop.. Call 410-675-7023 or toll-free 800-371-0409 for their current offerings. "Mother of Life" Note/Christmas Cards: Mother Of Life in smaller greeting card format -- the front reads, "And the Word was made Flesh" while the inside features the "Word Made Flesh" poem on the stages of Jesus' prenatal life by Nellie Edwards (the poem text can be read at Edwards' "Painted Faith (Visuals to Help Build the Culture of Life)" site. The Gospel of Life Icon by Msgr. Anthony La Femina. This theologically rich icon (embossed with gold and silver highlights) has been produced in several formats: For the icon click here, or click the following links and scroll down to see the prayer card version (item 0513) here or here. The Visitation Icon Click the title to see an image of the Visitation Icon, depicting the moment described in scripture when the unborn Jesus and unborn John the Baptist had their first meeting through Mary's visit to her cousin Elizabeth. 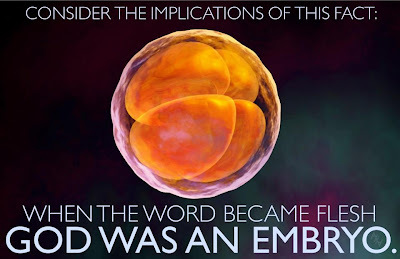 The unborn children are visible via the artist's window-on-the-womb rendering. This artwork is a helpful and memorable visual aid to highlight the prenatal life of Christ, and this important moment of interaction between John and Jesus before birth--card sized reproductions are ideal for school and church distribution. For wall art versions visit http://www.eikonastudios.com/store/, or go directly to their order page for the Visitation Icon -- use their contact link for small card pricing and availablility or call toll free 1-877-334-5662. Many graphics for the Day of the Unborn Child include the year and can only be used once. 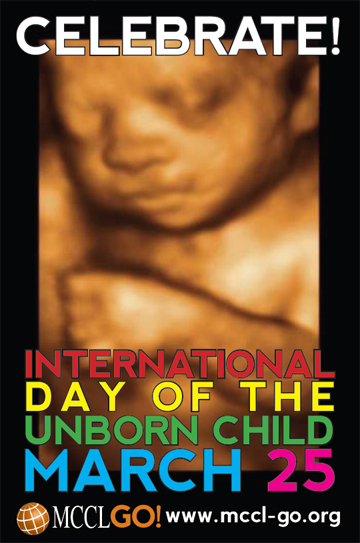 The following links provide a sampling of images that can be used annually as only the month and day are shown--for direct links, click to view & right-click to save): Free poster-type graphics can be found at visit http://prolifemn.blogspot.com -- The following image has simple white text with photo -- International Day of the Unborn Child graphic with March 25 date and photo quality image of unborn child -- the next graphic encourages us to "Celebrate" prenatal life on March 25th: International Day Of The Unborn Child March 25 graphic with multicolor text on background of high quality sepia-tone sonogram style image -- and another version same as previous with white text here. 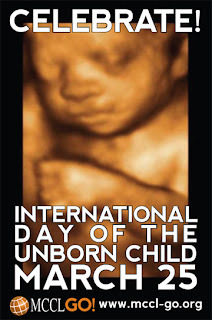 Another similar graphic with circular text around a photo of an unborn child can be seen at this site that also gives suggested activities for the Day of the Unborn Child -- http://cbcpforlife.com -- for a direct link to see the image click here. Other graphics used for the Annunciation/Day of the Unborn Child include the "God Was An Embryo" banner featured at this website that also includes prayers and blessings for the unborn (for a direct link to see the image click here), and also the "Jesus Once Looked Like This" graphic featuring the image of a human being at the embryonic age at this webpage that also explains the reasoning behind the image, which can be accessed directly here. Poster Set (10 laminated posters span the 9 months of pregnancy showing month-by-month prenatal development -- order the series that begins with the moment of conception -- the text for the first poster reads, "I'm here!"). Available from Heritage House '76, Inc. -- visit http://www.hh76.com -- or call 1-800-858-3040. These can be tied into the Annunciation and Jesus' Journey in the Womb by using them with the 10 "Jesus in the Womb" reflections included on a CD of attractively formatted documents in the Feast of the Annunciation Church/School Program of the Peoria Diocese Respect Life Board -- the first poster and reflection are used for the Annunciation, and the last for Christmas, while the remaining 8 cover the intervening months. To order additional publications that can be used with the Heritage House posters, see the section on the "Annunciation Church/School Program" booklets available via the Family Resources Center of the Peoria Diocese Respect Life Board, or One More Soul -- e-mail famresct@mtco.com or call 309-637-1713. Obligations and the Incarnation -- By Donald Prudlo, Ph.D. Proposes that the ancient Annunciation feast of Christ's conception and Incarnation be made a holy day of obligation for Catholics (replacing the fairly recent January 1st holy day to avoid the burden of an additional requirement). The author states that the Annunciation is a day "which has been historically underappreciated, and which – in light of the pro-life movement – could be a significant grace-filled opportunity for the Church. The obligation of attendance on 1 January should be shifted to the ancient feast of the Annunciation, or the Conception of Christ, on 25 March. Indeed in the medieval period this was New Year’s Day, for on this day the Son of God entered and changed human history forever." Read the full text here.